The Twelve Olympians, also known as the Dodekatheon (Greek: Δωδεκάθεον from δώδεκα, dōdeka, "twelve" and θεοί, theoi, "gods"), were the principal deities of the Greek pantheon, said to reside atop Mount Olympus. The Olympians gained their supremacy in a ten-year-long war of gods in which Zeus led his siblings to victory over their predecessor gods, the Titans. The concept of the "Twelve Gods" is older than any extant Greek or Roman source. The gods meet in council in the Homeric epics, but the first ancient reference to religious ceremonies for the Olympians collectively is found in the Homeric Hymn to Hermes. The Greek cult of the Twelve Olympians can be traced to 6th-century BC Athens and probably has no precedent in the Mycenaean period. The Altar of the Twelve Gods at Athens is usually dated to the archonship of the younger Pesistratos, in 522/521 BC. While the number was fixed at twelve, there was considerable variation as to which deities were included. 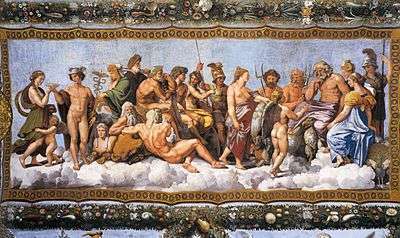 However, the twelve as most commonly portrayed in art and poetry were Zeus, Hera, Poseidon, Demeter, Athena, Apollo, Artemis, Ares, Aphrodite, Hephaestus, Hermes and either Hestia, or Dionysus. Hades, known in the Eleusinian tradition as Pluto, was not usually included among the Olympians because his realm was the underworld. Plato connected the Twelve Olympians with the twelve months, and implies that he considered Pluto one of the twelve in proposing that the final month be devoted to him and the spirits of the dead. In Phaedrus, Plato seems to exclude Hestia from the rank of "the twelve great gods". At Olympia there were six altars dedicated to six pairs of gods: Zeus and Poseidon, Hera and Athena, Hermes and Apollo, the Charites and Dionysus, Artemis and Alpheus, and Cronus and Rhea. 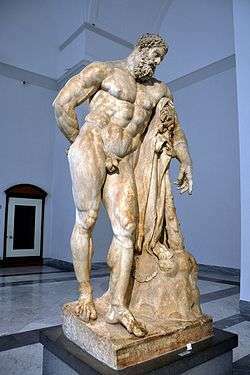 The historian Herodotus states that Heracles was included as one of the Twelve by some. At Kos, Heracles and Dionysus are added to the Twelve, and Ares and Hephaestus are not. For Pindar, the Bibliotheca, and Herodorus of Heraclea, Heracles is not one of the Twelve Gods, but the one who established their cult. Lucian (2nd century AD) includes Heracles and Asclepius as members of the Twelve, without explaining which two had to give way for them. Hebe, Helios, Selene, Eos, Eros and Persephone are other important gods and goddesses who are sometimes included in a group of twelve. Eros is often depicted alongside the other twelve, especially his mother Aphrodite, but not usually counted in their number. 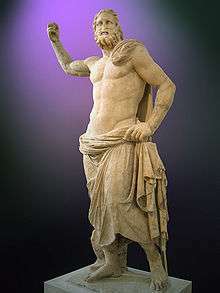 Zeus Jupiter King of the gods and ruler of Mount Olympus; god of the sky, lightning, thunder, law, order, justice. Youngest child of the Titans Cronus and Rhea. Symbols include the thunderbolt, eagle, oak tree, scepter, and scales. Brother and husband of Hera, although he had many lovers, also brother of Poseidon, Hades, Demeter, and Hestia. Hera Juno Queen of the gods and the goddess of marriage and family. Symbols include the peacock, cuckoo, and cow. Youngest daughter of Cronus and Rhea. Wife and sister of Zeus. 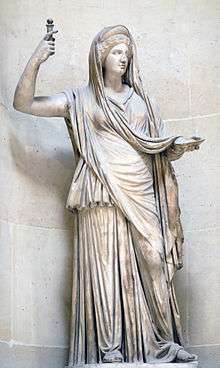 Being the goddess of marriage, she frequently tried to get revenge on Zeus' lovers and their children. Poseidon Neptune God of the seas, earthquakes, and tidal wave. Symbols include the horse, bull, dolphin, and trident. Middle son of Cronus and Rhea. Brother of Zeus and Hades. Married to the Nereid Amphitrite, although, like most male Greek Gods, he had many lovers. Demeter Ceres Goddess of fertility, agriculture, nature, and the seasons. Symbols include the poppy, wheat, torch, cornucopia, and pig. Middle daughter of Cronus and Rhea. Athena Minerva Goddess of wisdom, reason, intelligent activity, literature, handicrafts and science, defense and strategic warfare. Symbols include the owl and the olive tree. Daughter of Zeus and the Oceanid Metis, she rose from her father's head fully grown and in full battle armor. Apollo[A] Apollo[A] God of light, prophecy, inspiration, poetry, music and arts, medicine and healing. Son of Zeus and Leto. Symbols include the sun, lyre, swan, and mouse. Twin brother of Artemis. 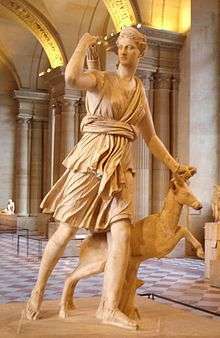 Artemis Diana Goddess of the hunt, virginity, archery, the moon, and all animals. Symbols include the moon, deer, hound, she-bear, snake, cypress tree, and bow and arrow. Daughter of Zeus and Leto and twin sister of Apollo. Ares Mars God of war, violence, and bloodshed. Symbols include the boar, serpent, dog, vulture, spear, and shield. Son of Zeus and Hera, all the other gods despised him. His Latin name, Mars, gave us the word "martial." 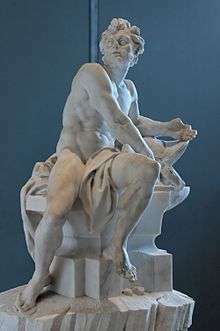 Hephaestus Vulcan Master blacksmith and craftsman of the gods; god of fire and the forge. Symbols include fire, anvil, axe, donkey, hammer, tongs, and quail. Son of Hera, either by Zeus or alone. Married to Aphrodite, though unlike most divine husbands, he was rarely ever licentious. His Latin name, Vulcan, gave us the word "volcano." Hermes Mercury Messenger of the gods; god of commerce, communication, borders, eloquence, diplomacy, thieves and games. Symbols include the caduceus (staff entwined with two snakes), winged sandals and cap, stork, and tortoise (whose shell he used to invent the lyre). Son of Zeus and the nymph Maia. The second-youngest Olympian, just older than Dionysus. 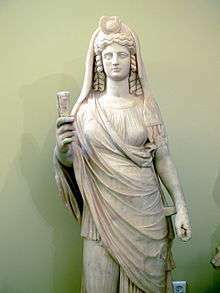 Hestia Vesta Goddess of the hearth and of the right ordering of domesticity and the family; she was born into the first Olympian generation and was one of the original twelve Olympians. 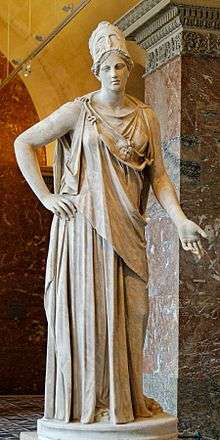 Some lists of the Twelve Olympians omit her in favor of Dionysus, but the speculation that she gave her throne to him in order to keep the peace seems to be modern invention. She is the first child of Cronus and Rhea, eldest sister of Hades, Demeter, Poseidon, Hera, and Zeus. 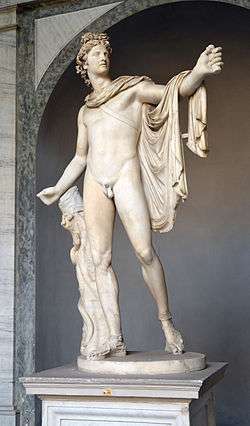 Bacchus) Bacchus God of wine, celebrations, and ecstasy. Patron god of the art of theatre. Symbols include the grapevine, ivy, cup, tiger, panther, leopard, dolphin, goat, and pinecone. Son of Zeus and the mortal Theban princess Semele. Married to the Cretan princess Ariadne. The youngest Olympian god, as well as the only one to have a mortal mother. The following gods and goddess are sometimes included as one of the twelve Olympians. 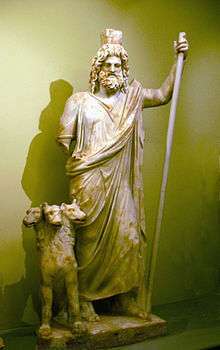 Dis Pater) God of the Underworld, dead and the riches under the Earth; he was born into the first Olympian generation, the elder brother of Zeus, Poseidon, Hera, and Demeter, and younger brother of Hestia, but as he lives in the Underworld rather than on Mount Olympus, he is typically not included amongst the twelve Olympians. Heracles Hercules A divine hero, the son of Zeus and Alcmene, foster son of Amphitryon and great-grandson (and half-brother) of Perseus (Περσεύς). He was the greatest of the Greek heroes, a paragon of masculinity and a champion of the Olympian order against chthonic monsters. Persephone (or Kore) Proserpina Queen of the Underworld and a daughter of Demeter and Zeus. Also goddess of spring time. She became the consort of Hades, the god of the underworld, when he kidnapped her. Demeter, driven to distraction by the disappearance of her daughter, neglected all of the earth so that nothing would grow. Zeus eventually ordered Hades to allow Persephone to leave the underworld and rejoin her mother. Hades did this, but because Persephone had eaten six of the twelve pomegranate seeds in the underworld when Hades first kidnapped her, she had to spend six months in the underworld each year. This created the seasons when for six months everything grows and flourishes then for the other six months everything wilts and dies. Her symbols include the pomegranate, willow tree, waterfalls, rivers and springs. 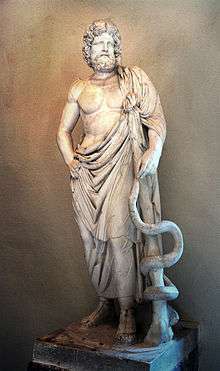 Asclepius Vejovis The god of medicine and healing. He represents the healing aspect of the medical arts; his daughters are Hygieia ("Health"), Iaso ("Medicine"), Aceso ("Healing"), Aglæa/Ægle ("Healthy Glow"), and Panacea ("Universal Remedy"). He is the son of Apollo and Coronis. Eros Cupid (or Amor) The god of sexual love and beauty. 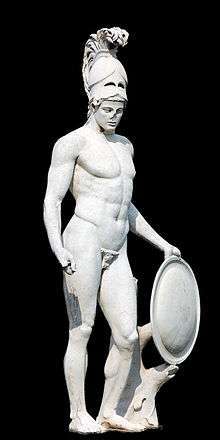 He was also worshipped as a fertility deity, son of Aphrodite and Ares. He was depicted often as carrying a lyre or bow and arrow. He is often accompanied by dolphins, roses, and torches. Hebe Juventas She is the daughter of Zeus and Hera. Hebe was the cupbearer for the gods and goddesses of Mount Olympus, serving their nectar and ambrosia, until she was married to Heracles. She is the goddess of youth. The following gods and goddesses were not usually counted as Olympians, although they had close ties to them. Aeolus – King of the winds, keeper of the Anemoi, master of the seasonal winds. Alpheus – God of the River Alpheus. Amphitrite – Queen of the Sea, mother of Triton and wife of Poseidon. Anemoi – The personifications of the four wind directions (North, South, East and West). Angelos – An underworld goddess, a daughter of Zeus and Hera. Aura – Goddess of cool breezes and fresh air. Bia – Personification of force. Circe – Minor goddess of magic, not to be confused with Hecate. Deimos – God of terror, son of Ares and brother of Phobos. Dione – Oceanid; mother of Aphrodite by Zeus in Homer's version. Eileithyia – Goddess of childbirth; daughter of Hera and Zeus. Enyo – A goddess of warfare, companion of Ares. She was also the sister of Ares in some cases. In those cases, her parents are Zeus and Hera. Eos – Personification of dawn. Eris – Goddess of discord and strife. Ganymede – Cupbearer of the gods' palace at Olympus. Graces – Goddesses of beauty and attendants of Aphrodite and Hera. Harmonia – Goddess of concord and harmony, opposite of Eris, daughter of Aphrodite. Hecate – Goddess associated with magic, witches and crossroads. Helios – Titan; personification of the sun. Horae – Wardens of Olympus. Hypnos – God of sleep, father of Morpheus and son of Nyx. Iris – Personification of the Rainbow, also the messenger of Olympus along with Hermes. Kratos – Personification of power. Leto – Titaness of the unseen; mother of Apollo and Artemis. Metis – Oceanid; mother of Athena. Moirai – The 'Fates'. Clotho (the spinner), Lachesis (the allotter) and Atropos (the unturnable). Momus – God of satire, mockery, satires, and poets. Morpheus – God of dreams. Muses – Nine goddesses of science and arts. Their names are Calliope, Urania, Clio, Polyhymnia, Melpomene, Terpsichore, Thalia, Euterpe, and Erato. Nemesis – Greek goddess of retribution and revenge, daughter of Nyx. Nike – Goddess of victory. Nyx – Goddess of night. Pan – God of the wild, shepherds and flocks. Perseus – Son of Zeus and Danae, slayer of Medusa, the legendary founder of Mycenae and of the Perseid dynasty. Phantasos – God of surreal dreams. Phobos – God of fear, son of Ares and brother of Deimos. Selene – Titaness; personification of the moon. Styx – Goddess of the River Styx, the river where gods swear oaths on. Thanatos – God of Death, sometimes a personification of Death. Theseus – Son of Poseidon, first Hero of Athens and slayer of the Minotaur. Triton – Messenger of the Seas, son of Poseidon and Amphitrite. He holds a twisted conch shell. Tyche – Goddess of Luck. Zelus – Personification of Emulation. 1 2 "Dodekatheon". Papyros-Larousse-Britanicca (in Greek). 2007. ↑ Rutherford, p. 47; Burkert, p. 125; Ogden, pp. 2–3. 1 2 "Greek mythology". Encyclopedia Americana. 13. 1993. p. 431. ↑ Long, p. 141; Rutherford, p. 47. ↑ Berger-Doer, Gratia (1986). "Dodekatheoi". Lexicon Iconographicum Mythologiae Classicae. 3. pp. 646–658. ↑ See, for example, Ovid's Met. I 441, 473, II 454, 543, 598, 612, 641, XII 585, XVIII 174, 715, 631, and others.